Take the test and see what kind of impact you have on slavery. You will be amazed! www.catholicsocialjustice.com. Please pray for all to be inspired by the Pope's words - to make Earth our common home, to share the gifts God has so generously provided, and to protect the Earth for future generations. artwork to help keep you focused. Just click on the link below. If you are thinking about coming back to the Catholic Church, or have many questions about your faith, please visit Catholics Come Home on the link below! Welcome Home! CathFam is dedicated to equipping parents to create a vibrant, faith-centered, Catholic culture in their home. The monthly e-magazine with faith-building tips for all families. Topics range from child-rearing to nurturing your spousal relationship to liturgical season insight. Check it out! New Website Helps Catholics be "Salt and Light"
WeAreSaltAndLight.org, a new website of the U.S. Bishops' Department of Justice, Peace and Human Development, helps Catholics respond to Jesus' call to be "salt of the earth" and "light of the world" (Mt. 5:13-16). 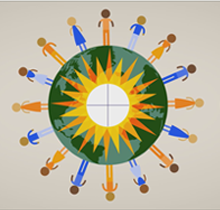 WeAreSaltAndLight.org equips Catholics to live out Pope Francis' call to "go forth" on mission. It also seeks to help Catholic communities-especially parishes, dioceses, schools, universities, seminaries, religious communities, and ecclesial movements-to carry out the vision of the U.S. bishops' landmark document, Communities of Salt & Light: Reflections on the Social Mission of the Parish.